After downloading Git the other day, I discovered Windows PowerShell. I've heard about it but I was not aware that it comes with the OS. After playing with it for a couple of days, I came up with this function. This not written in AHK but rather in PowerShell scripting language(the original version uses both AHK and PowerShell but I rewrote it to optimize the purpose and reduce dependencies). This allows the user to dynamically run AHK code from within the console. It's basically HotKeyIT's DynaRun converted to a PowerShell script. 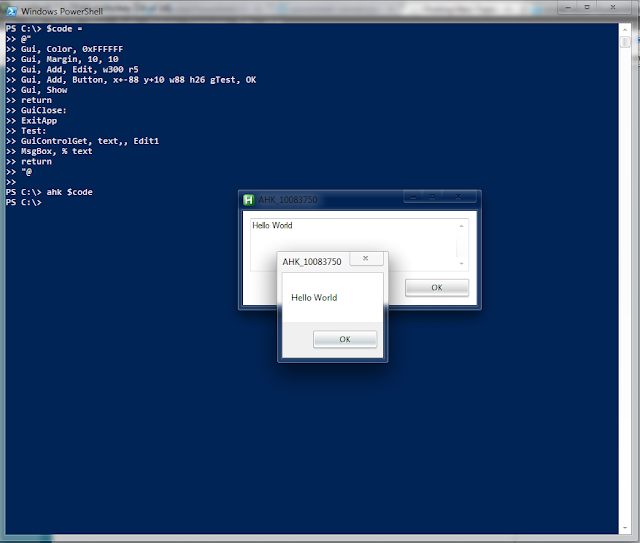 Tested on Windows 7 Ultimate(x86) using AHK v.1.1.09.02(Unicode) and PowerShell 2.0. I have not tested this with the ANSI version of AHK. See below for workaround. $ahkPath = [Environment]::GetFolderPath("ProgramFiles") + "\AutoHotkey\AutoHotkey.exe"
I haven't written any PowerShell script nor have any knowledge of .NET so pardon any mistakes in implementation, code, etc. Comments are very much welcome.